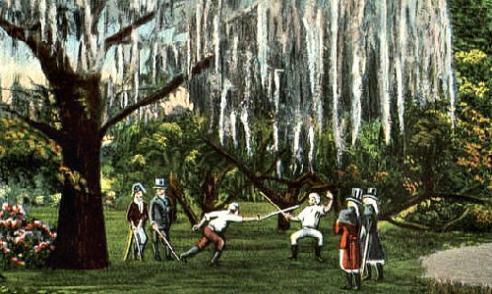 "The DeLissue - Le Bouisque Duel in 1841"
Continued from "Night at the French Opera"
sabers. Bozonier was a trifle above the middle height, but remarkably active and muscular. to last till one of the adversaries should be completely disabled. had not Coppens, by a timely movement, warded off partly the effect of the blow. from a terrible gash on the cheek and a severe cut in the chest. Zouaves and lost his life during the Civil War. field of honor" or "He fell in a duel." scene of a thousand encounters.